(Newser) – President Trump is apparently still feuding with John McCain—seven months after the senator's death. After a report that a McCain associate had leaked the infamous Russia dossier, Trump quoted Ken Starr as saying it was a "very dark stain" on McCain's record and tweeted that the senator had "far worse stains," including his vote against repealing ObamaCare. 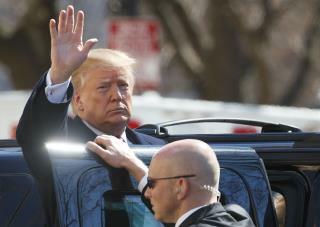 In another tweet Sunday, Trump claimed it had been proven that it was "'last in his class' (Annapolis) John McCain that sent the Fake Dossier to the FBI and Media hoping to have it printed BEFORE the election," CNN reports. According to the Washington Post, McCain graduated fifth from last in his class, was not aware of the dossier until weeks after the election, and did not share it with the media. trump is just a classless pig. My brief run-in with McCain was infuriating enough to remember it vididly after more than 45 years. It makes me wonder what happened when McCain met Trump before running for President in 16. POS Trump will always be a POS!